Or, uh, actually, for Matt, who has asked me to make curtains for our bedroom at least once a week since we have moved up here. So, umm, hi, here ya go, Matt! Really, I have no idea what took me so long to get around to making these. Well, actually, I kinda do… the ironing. Oh, the ironing. There’s so much of it involved in making curtains, even wee ones for wee windows. But more on that in a bit. The print is a little dizzying if you stare too long, but it’s distracting enough to offset the gauziness of the cotton. Not sure I’m totally sold on it, though. I’m thinking of making another set soon maybe in one of the new Lotta Jansdotter prints coming out this spring. Sew the sides first – press them 1/4 inch to the wrong side, then fold that over 3/8 inch, press, and stitch 1/8 in from that folded edge. Next, I do the top – fold 3/8 inch, press, fold another 1/2 inch to cover the raw edge, topstitch 1/8 inch away from the folded edge, then fold 4 inches over, press, stitch. Repeat the process for the bottom hem except I fold that 3 1/2 inches, and I stitch the sides closed once I’ve sewn the hem up. So there you go. Very basic, not fancy at all. I didn’t even do tabs, so I know they’re not “proper” curtains, but they do the job, slide back and forth smoothly, and let in just the right amount of light. Easy project for a rainy day! hi there! do you know what fabric line this is from? it's exactly what i'm looking for to finish a quilt back. thanks! I'll have to keep this in mind for when we move. 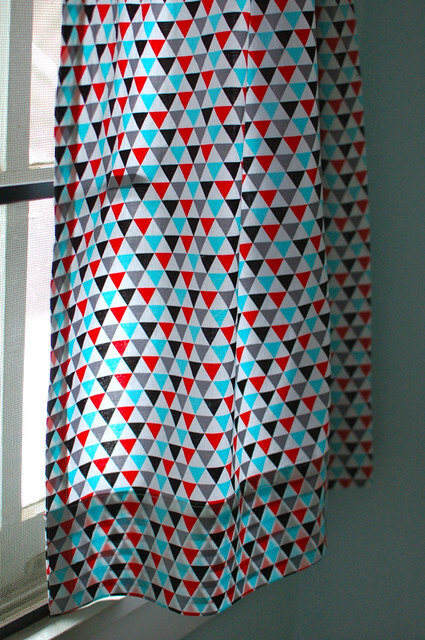 I don't have curtains now, but it seems silly to make them now too.